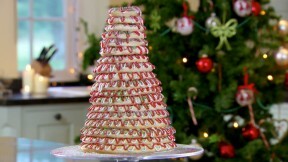 This Kransekake recipe by Paul Hollywood is featured in the Season 1 Masterclass: Christmas episode. Tip the ground almonds and icing sugar into a large bowl. Add the egg whites and almond extract and mix to a dough with your hands. Cover the bowl with cling film and chill for a minimum of 2 hours but preferably overnight. Lightly oil the kransekake moulds and sprinkle with semolina, shake off the excess semolina. Preheat the oven to 375F. Divide the dough into 6 pieces. Divide each of the 6 pieces into 3 pieces of increasing size, one small, one medium and one large. Roll each piece into finger thick lengths and sit them in the moulds. Join the ends by squashing them together. Repeat with the remaining pieces of dough until you have 6 moulds each containing 3 circles of dough. Bake for 10 mins, until golden. Remove from the oven and leave to cool on the metal moulds until hardened then transfer to a wire rack to cool completely. For the icing, whisk the egg whites in a large bowl until frothy. Add the icing sugar to the egg whites, a spoonful at a time, and fold in. Beat the icing until it is very stiff and white and stands up in peaks. Spoon half of the icing into a separate bowl and colour red with food colouring paste. Spoon into a piping bag fitted with a small plain writing nozzle. Spoon the white icing into a separate piping bag fitted with a small plain writing nozzle. To assemble the Kransekake, sort the cooked rings into sizes. Pipe a few dots of white icing onto the base of the largest ring and stick it the centre of a serving plate. Pipe the white and red icing in a zig zag pattern around the ring. Sprinkle with red, green and silver edible glitter. Place the next size ring (working from the biggest ring to the smallest ring) on top of the iced ring, (The piped icing will help it stay in place.) Pipe red and white icing around the ring in a zig zag pattern and sprinkle with glitter. Repeat the process with all of the rings, working in decreasing circles until you have a tower of 16 iced glittery rings.